I have followed the blog Enjoying the Small Things for probably the past couple years, and it has been consistently among my favorite internet reads. It’s written by Kelle Hampton, mother of two beautiful girls, the youngest of whom has Down syndrome. It has a huge readership, so many of you may already be familiar with it. In fact, a lot of people have recommended it to me in the last couple weeks. Kelle also recently published a book, which I just received as a gift and can’t wait to read. I’ve always strongly identified with her perspective on finding joy in the unexpected. In the earliest moments of coming to terms with Lina’s diagnosis, I thought a great deal about that blog. It seemed so STRANGE that after so long reading about the Hampton family, I was now on such a similar journey. There have been moments when I have almost felt as if I somehow wished this upon myself. But aside from the uncanniness of the whole thing, it was so encouraging to be able to think about the beautiful photos of Kelle’s family. It helped me begin to picture our own family’s future. It seemed as if the time I had spent reading that blog had in some small way been preparation for Lina’s arrival. In fact, there are a lot of things that, looking back, have probably helped prepare me for the experience of being Lina’s mommy. My dad was in an accident when I was 18 months old that left him legally blind. “Different is okay” was a theme of my upbringing, not just in what my parents said to us but in the whole way our family lived. I spent many, many hours at disability awareness seminars my parents helped conduct at churches all over the region. I had a childhood friend with a chromosome disorder similar to Down syndrome. But it’s also been a bit jolting for me to realize how different it is now that it’s MY baby. I have smiled at children with Down syndrome in the stores or at the park and thought, “He is adorable,” or “She is just precious.” But suddenly I was thinking about the closet full of gorgeous clothes for my little girl and having a very hard time picturing those clothes on a child with Down syndrome. This is me being brutally honest. I was so accepting of everyone else’s children with Downs, but coming to terms with it being my child was a whole new ball game. Those first couple days were complicated. I was initially in shock, just trying to wrap my head around this new reality. How I felt varied from minute to minute. Jon wanted to be sure we were able to celebrate the arrival of our sweet baby. I agreed, but I was surprised by what a relief it was when I called our embryo adoption counselor to tell her about the situation and her first response was, “Oh, Jolene, I am so sorry.” At that moment, I was hungry to have my feelings of grief and loss validated. I cried and cried on the counselor’s virtual shoulder. Jon seemed to have an easier time coming to terms with Lina’s diagnosis than I did in those first few days. He was immediately on the internet, reading wikipedia entries and finding blogs by parents of children with Down syndrome. He found it encouraging to read stories of people with Downs leading successful lives. I wasn’t there yet. I did think and talk about the positives, but I was also grieving. During our NICU stay, I picked up a book about Down syndrome that had been given to us by our contact at Vandy’s Downs clinic. I started reading through the list of common health and developmental problems, and suddenly I felt very angry. It wasn’t so much for myself, but I was angry that my precious baby was going to have to face so many extra challenges. I resented that so many children would breeze through their milestones while my Lina had to work so much harder for every achievement. I felt envy for parents with “normal” babies. I thought about all the children in our circle of friends who will be so close to Lina’s age, and I grieved for the type of friendships I had imagined for my daughter. I thought about the family of the future I had imagined so many times: big, loud holiday gatherings with lots of grandchildren to fill our golden years. I thought, “Corin better marry someone who wants a lot of kids,” and then I thought, “Goodness, I hope I don’t actually put that kind of pressure on him.” Jon and I talked about how he had fallen in love with the name Eline because he pictured how elegant it would look on a wedding invitation. I felt keenly the loss of that future I had imagined for my daughter. And yet, even as I grieved, God was working on my heart. Truthfully, I wasn’t doing a whole lot of praying. I just didn’t have the words, or the heart, to try to piece together what I needed to say to Him. Our first night in the NICU, I stood in the middle of the room after a midnight feeding, tears pouring down my face, and told God, “I don’t know what to say, but you know what’s in my heart. I need you more than ever before.” My faith was weak, and I was facing that question without an answer: “Why?” Why, after all the lengths we went to to give us the best odds of a healthy baby, after all the prayers we prayed, specifically asking God to bless our child with intelligence and to guide her development in the womb, why this outcome? Why, when it came to building our family, could nothing just be simple? I knew there was no answer, but asking the questions was a part of trying to process an outcome that was so very different from the expectations we held so closely for all those months. Slowly, over those days in the NICU and in the following days since we’ve been home, my perspective has begun to shift. The second night in the NICU was much better than the first, and I found myself beginning to really bond with Lina. 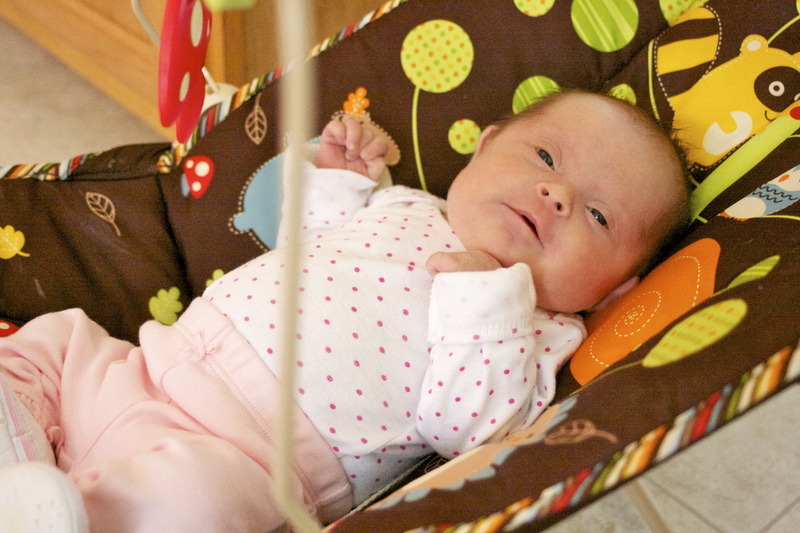 Over those late-night feedings, I looked into her face and began to recognize my daughter. The wheels of those deep instincts of motherhood began to turn, and I realized that already, I would go to the ends of the earth to give this child the best odds of happiness and success. I began to see more clearly that my child’s extra chromosome will not prevent her from finding that happiness and success. Jon and I talked about how many “normal” people lead lives of dysfunction and unhappiness. It somehow brought me comfort to remember that having a child without development challenges does not guarantee freedom from parental disappointment or heartache. I began to remember the truths of those disability seminars: We all have our own difficulties. Some may be more visible than others, but they are there. Lina will have more challenges than some, but it was sinking in that she will find her own path to achievement and fulfillment. It is our job to help her. She will have her own interests and passions, her own talents and skills. They might not look like those we had imagined, but they will bring her happiness. I began to value the innocence she will likely carry with her through life. As I have gotten to know this tiny new person over the past three weeks, I have fallen more and more in love. She is my precious daughter. I have stood over her cradle, watching her sleep, and breathed the prayer of every God-fearing parent: “You have entrusted her to me. Teach me. Help me be the mother she deserves.” I have looked down at her tiny form in the stroller as we walked at the greenway and felt joy that she is mine. I am more certain every day that her diagnosis does not change the fact that God chose this child for our family. I believed all along that He led us to embryo adoption, to our donor family, and to this baby. Yes, there is disappointment, confusion and pain, but I know Lina is a priceless gift, and I believe deep down in my soul that she will be a blessing in ways we can’t yet imagine. Our day-to-day reality right now is really just your normal newborn stuff: round-the-clock feedings, sleep deprivation, lots and lots of tiny diapers, soaking burp cloths, the struggle to balance the needs of a toddler and a newborn while maintaining a semblance of normal routine. But truthfully, most of the time I’m finding it to be easier than I feared. I reserve the right to change my mind at any time, but for now, I am able to enjoy the tiny newborn stage with much less stress than I experienced with Corin. Lina’s feedings are complicated (nursing, pumping and supplementing by bottle), but she’s actually a better eater than Corin was at this age. Lina is a snuggler, and as much as I want her to sleep in her cradle peacefully all night, I kind of enjoy that she likes to be held close. I remember feeling in those first weeks with Corin as if someone had dropped me off on an alien planet; I recognized nothing of my life. This time, I have been pleasantly surprised by how much of our family life feels normal, even as so much has changed. As we mark three weeks of Eline’s life, I am finding joy in picturing her as she grows. I think she’s going to be beautiful. And those clothes hanging in her closet? They are perfect for her. I know it won’t all be smooth sailing from here. There are still times when my heart hurts, and there will be many more of those as we walk the road in front of us. But this is our road, and as different as it is from where we thought we would be, it is beautiful in its own right. Here’s to the journey ahead. This entry was posted in Our Story, Parenting and tagged down syndrome. Oh how I loved this. And what a powerful point that there are normal people living lives of dysfunction. Great reminder. What a beautiful road it will be ahead…. You are a beautiful writer and tell a very beautiful story. If you are willing to answer, I I was curious if have you spoken with the donor family about Lina’s diagnosis? And, if so, what was their reaction? Congratulations on your new addition and I wish you contnued strength and peace. Thank you, and I am happy to answer. I actually will write a little more about this soon, but yes, I have been in touch with the donor family to let them know about Lina’s birth and her diagnosis. They have been very supportive and have expressed an interest in learning more about Down syndrome along with us. God will bless your journey with your precious baby …… Just keep leaning on Him! Thanks for sharing with us Jolene. I can only imagine the range of emotions you have gone through and continue to feel. Lina is a beautiful little girl, and I know you and Jon will be the best parents she could ever have. We are praying for you daily, and can’t wait to watch little Lina grow! You have put so beautifully into words the many things that floated in and out of my mind as I have celebrated and grieved with you. I knew that God would get you to this place because you and Jon are some of the most amazing people I know with a strong faith in our loving Lord. And I believe with all my heart that God prepares us for the challenges we will face with all of our children! He wouldn’t be the God of love I believe Him to be if He didn’t! Wishing we could walk this road with you more physically, but know that you are constantly in our thoughts and prayers. I so appreciate your honesty in sharing this journey! You have captured the beginning of your journey so beautifully. I love your honesty about how your faith was weak, but you still found a way to push through. You’re so strong and a true testimony of God’s grace. Jolene you are an elegant writer…..you should write a book about this journey. Lina is so beautiful and she has a wonderful mother who will find strength in God to guide her as she grows to be all she can be. As a fellow caregiver, I love the way you are expressing the pain and joys of your experience. As a personal friend of your parents and knowing you as a child, I am also thrilled to see where your life has and is taking you. God has indeed been preparing you all along for this adventure. Beautiful Jolene, just beautiful!! She is a precious little one and your words brought tears to my eyes… Thank you for sharing your heart with us! Lina’s life will touch so many others — deepening their compassion and patience. I’m sure you already realize that her life will impact Corin’s. My childhood was far different as I became accustomed to spending time at “Infant Development” classes when Amy was a baby — starting school at 18 months or hanging out in the waiting room at Children’s Hospitals and at various testing sessions for hours. There were times I felt “robbed” of that sister relationship I saw others enjoying, read about in books, saw in movies and mentioned on greeting cards, even as an adult. But I wouldn’t change the blessing she has been to my life. Growing up with Amy made me a different, better woman. When other childhood friends expressed a desire to become a nurse, chef or teacher when they grew up I always knew that I wanted to work in Special Ed. I ended up in Dental Hygiene instead, but did realize that dream of Special Ed when I contracted at an “institution” for severely challenged adults. I’ve never had more fulfilling work in my career. And now I see how Amy’s life is impacting the emotions, choices and characters of my own children. Her life is creating an empathy in them that they might have otherwise never have realized. And won’t heaven be so much sweeter when Jesus comes back to take us all home. I can’t wait to get to know my sister all over again then. Know that nothing comes to us that hasn’t been approved by Christ — HE is your source of strength and knowledge and HE will grow you all through this journey. We’re praying for you guys — including Amy — she watches for photos and asks for updates, and she’s a prayer warrior, you know.